Stubborn people are a pain. I know: I am one, and I’ve caused myself and many others lots of pain as a result. In fact, I am more stubborn than you are. Yes I am. Yes I am! 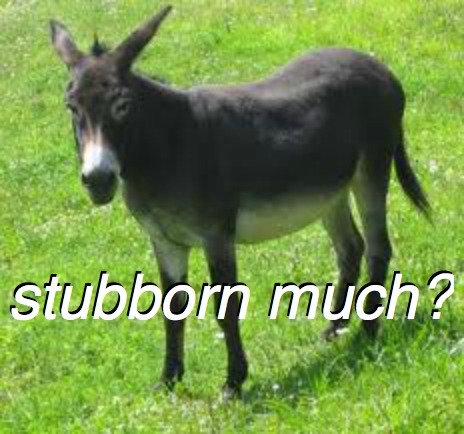 While we’ve all seen the negative impact of donkey-like stubbornness, this troublesome characteristic can be molded into a positive trait. Check your motives. Many times, our stubbornness stems from feelings of vulnerability or lack of control. If we feel threatened by moving, we will refuse to move. Our insecurities can result in obstinance. Next time you assume a strong position on an issue, ask yourself why you are assuming that position. If it is because you may lose face, consider working on your self-esteem. Your value is not determined by how immoveable you are. Play the “worse case scenario” game. Explore what bad could potentially happen if you refuse to give up your stance on a particular issue. In most cases, the world will keep spinning even if you agree to change your stance. Choose which mountain is worth dying on. Not every issue is life or death. You may succeed in refusing to budge but you may lose relationships over it. Which is more important to you? Even if you are right, life is too short to live alone. Don’t allow your bullheadedness to end friendships. Show a little “give” on something. Find something you have taken a position on, make it something that is not a core value or conviction for you. Now give up your position. Let it go. Go ahead, it won’t kill you. Hang onto your stubbornness in some areas. Never compromise your integrity or character – for anyone. When someone ties to break you down, dig in and stay committed. But learn when to be stubborn and learn when to compromise. Come on, let’s control our stubbornness. We will like ourselves better, and so will others. Next PostNext a TIM TEBOW signed football auction!